Because you can never have too many pairs, take 30% off all denim styles at Piperlime today only! For spring, this light wash skinny pair by Paige seems ideal. If you’re a fan of tailored classics, try this style or this pair. Branching out in the color department? I suggest a pair of grey jeans or this pale pink pair! Enter code GOODJEANS at checkout – click here to shop! Save up to 60% off at Alexander Wang! SO many new reductions and items added to the sale, like this gorgeous grey shoulder bag, this cool utilitarian coat, this back-zip sweater, and these cutout mules. Also loving this tank dress for spring! Click here to see + shop all sale merchandise. You absolutely cannot miss this Pottery Barn sale – the more you spend the more you save! Save 10% off $100 or more, 15% off $250 or more, 20% off $500 or more and 25% off $1,000 or more! Now’s the time to invest in those big ticket items like this luxe Bosworth rug, these cool horn napkin rings and this chic antique silver tiered stand (for afternoon tea, perhaps?). Also loving this Paris embroidered pillow case, this cheeky “tray chic” wood tray and this stunning small chandelier. Enter promo code SAVEMORE at checkout – ends tomorrow! Those earrings are so pretty, great picks as always. Love this roundup, especially that pretty necklace! You always have the most refined taste in coats! Love all these items..but those geometric earrings by Lizzie Fortunato, what an amazing find! Adding those to my wish list asap! Love, love, love that heather gray coat. Love the necklace and its pretty details! Okay, this just makes me want to go on a vacation, stat! I love that dress, it looks like it would be super versatile. Love this neutral tone! The dress is so beautiful! Thanks for all the inspo! I can recognize your style on every pice! :) The earrings are really beautiful! I really like the color palette here. 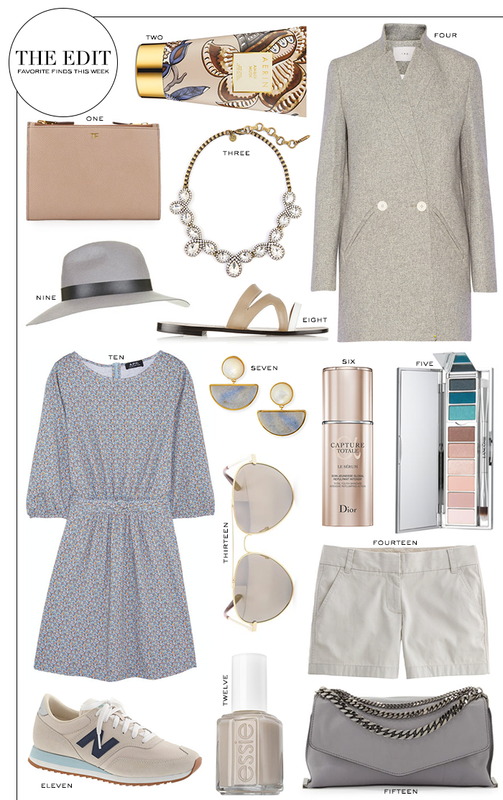 The hat and Milly bag are a must! The amber musk is one of my favorite scents! I don’t think I’ll ever be able to pull off the sneaker with a dress look. Even when I do oxfords with a dress it just makes me look stumpy! ButI think it’s great for taller girls or people with longer legs haha! These picks have me dreaming of spring! Love that dress! LOVE the dress and grey bag! Perfect for spring.